Forms available as downloadable Word Documents. Scroll to the bottom of this page or email FunMusic4Kids@aol.com if you do not see the most recent registration form. Visit our Donate Page to see our Indiegogo Campaign or view our fundraising video. No food during class as this presents a choking hazard. Water in sippie cups and water bottles is permitted. Pacifiers are discouraged as they prevent infants and toddlers from audiating and experimenting with their tonal/vocal development. Please do not bring toys to class as they are a distraction to other children. Also, please do not refer to instruments used in class as toys. Instruments are tools that we use to make music and it's important for children to understand the difference as many "tools" require supervised use and care. Try to avoid talking to other parents during songs or in between songs as this inhibits the full language immersion aspect of the program and disrupts the flow of the class. Try to arrange for play dates outside of class time to further socialization rather than missing important musical milestones or parent education information in class. 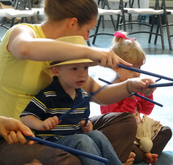 Miss Pam is the facilitator and your level of participation and modeling in the class will be the greatest contributing factor to your child's musical development. Enthusiastic play and positive feedback to your child, regardless of your musical ability, is essential. Understand that all children learn differently and very often young children observe and soak in what we do in class, then repeat the behaviors at home or in the car during your home music play where they feel safe. It is not developmentally appropriate to expect them to "perform" at this age, nor do we ever expect them to. Musiking is a natural ability like walking and talking that can be learned within the context of early childhood exposure, so daily exposure outside of class will help reinforce these skills and expedite development. Also, remember, everyone has bad days. Your child's temperament will continually evolve and change...roll with it and even if they have an off day, we all understand. If you have a bad day, the best thing you can do is dive right into a silly song and you'll be amazed at how playing music with your child can lift even the darkest cloud!